Phnom Penh (FN), Sept. 13 - Cambodian member of parliament of the ruling Cambodian people party Suos Yara urged President of Socialist International George Papandreou to consider the negative proposal raised by S&D Group in the European Parliament on Cambodia’s domestic politics, according to the letter dated on 12 September 2018. 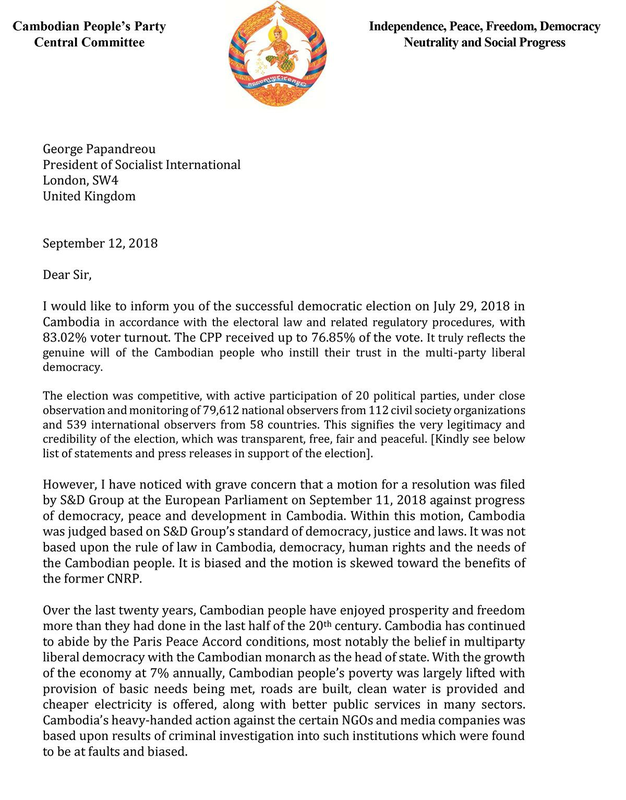 "As a partner of the SI, I urge you to seriously consider the negative proposal raised by S&D Group in the European Parliament on Cambodia’s domestic politics and demand them to withdraw their motion immediately so that the CPP and SI remain close friends and continue jointly working together to achieve the goals of UNSDGs for the people," Yara wrote in the letter. "As a democratic country such overwhelming referendum of the people in support of the work of the CPP shows that the people have put trust in the party to lead and to continue building peace and develop the country in all sectors for the next five years and beyond," he added.